We stumbled on a new Fun ‘n Games website this week – whirled.com. Among the offerings at this fine webspace is Filled, a highly playable game that you can dally about with for a few minutes or lose yourself in a zenlike maze of bubbles and bouncy balls for quite some time longer. As with most of the games we offer for your enjoyment in this space, game play is simple and engaging. 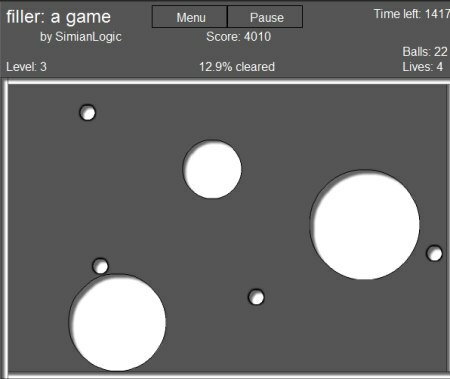 The object is to fill 2/3 of the playing area by clicking on the screen and creating inflated spheres. They inflate at a steady rate until you release the mouse or one of the bouncing balls hits it. You can move them around the screen while they inflate, and once you let go, gravity takes over. You only get a certain amount of lives, so don’t let the bouncing balls pop too many of them! The game starts at a leisurely pace with a mere two bouncing enemy balls but the levels build quickly and it gets ever harder to fill up that 2/3 of the screen. Play on dear readers and happy weekend!